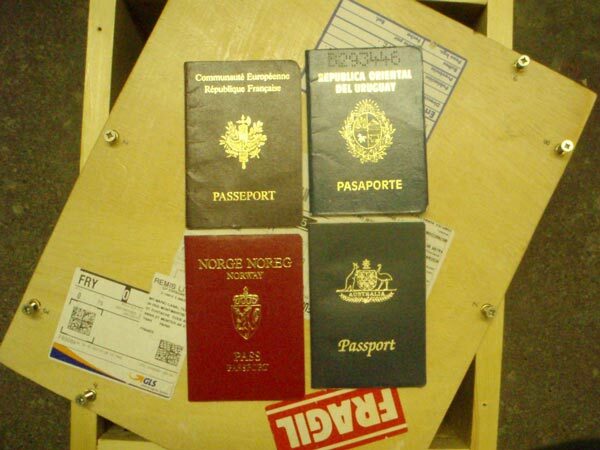 The artist has collected passports, identity documents and credit cards from robberies carried out by burglars in Barcelona. The city, do to its urban organisation, is the ideal setting for this type of crime, because burglars can quickly empty the content of bags, get only cash and abandon the rest. Santiago collected 25 documents that were camouflaged as artistic objects and transported in Paris with the aid of a company specialised in artwork transport, to be displayed on a gallery – becoming available material for anyone who may wish to take them, recovering their criminal origin.